Four Seasons Resort The Biltmore Santa Barbara will reopen on June 1, 2018, following a nearly five-month closure caused by the California mudslides. 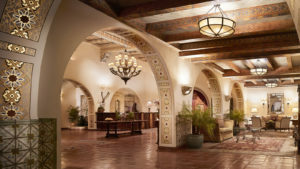 The AAA five-diamond resort, which is renowned for its authentic Spanish Colonial design, was restored by a team of experts. Their work included extensive landscaping and restoration of some back-of-house areas and guestrooms. Originally built in 1927 by architect Reginald Johnson, the resort sits on 22 oceanfront acres. It has 167 guestrooms, 40 suites and 15,000 square feet of event space, including two ballrooms and nine meeting rooms. It can accommodate groups ranging in size from 10 (private dining) to 400 (outdoor banquet). This summer the resort is adding to its selection of specialty suites and bungalows, with the opening of its new Anacapa Suite in July. This suite offers guests 2,500 square feet of livable luxury overlooking the Pacific Ocean and Butterfly Beach and features a 15 by 17 foot plunge pool, fire pit and private driveway as well as complimentary access to the private-membership Coral Casino Beach and Cabana Club.